U.S. 285 southbound at the cloverleaf interchange with C-470 in Lakewood. U.S. 285 upgrades to a freeway for nine miles west from Sheridan to SH 8 at south Morrison. Photo taken 08/11/14. Starting in Texas, U.S. 285 passes through New Mexico before entering the Centennial State through San Luis Valley. Through Colorado, U.S. 285 runs 263.95 miles through south central and central parts of the state. Following a fairly linear route 23 miles north from Antonito, U.S. 285 combines with U.S. 160 west for a 17 mile overlap to Monte Vista. The route then bee lines north 35 miles to Saugache, riding along agricultural and ranch land east of the La Garita Mountains. Curving northeast from Saugauch, U.S. 285 circumvents the Sawatch Range through the north end of San Luis Valley. The US Highway climbs to 9,010 feet across Poncha Pass, winding between Cleveland and Poncha Mountains and lowering back to around 7,500 feet above sea level at Poncha Springs. A short concurrency ensues at Poncha Springs with U.S. 50, which travels west to Gunnison and east to Pueblo. Northward, U.S. 285 traverses Missouri Park and parallels the Arkansas River to the west en route to Nathrop and U.S. 24 at Johnson Village. U.S. 24 & 285 combine east across San Isabel National Forest to the north of Triad Range and south of Limestone Range. The pair separate beyond Trout Creek Pass (el. 9,346 feet) at Antero Junction, with U.S. 24 continuing east to Colorado Springs and U.S. 285 resuming a northward heading 21 miles to Fairplay. Beyond Fairplay, U.S. 285 makes a gradual approach to the Denver metropolitan area via Red Hill Pass (el. 9,983 feet) and Kenosha Pass (el. 10,000 feet) east into the Platte River Mountains. Following the North Fork of the Platte River, U.S. 285 winds east to Bailey and north to Pine Junction, where it enters Jefferson County. The highway briefly expands to four lanes at Shaffers Crossing, while alternating with an added passing lane to the RIRO connection with Blackfoot Road. The remainder of U.S. 285 leading through the mountains west of Lakewood and the southwest Denver suburbs varies as a four lane highway with expressway type qualities to Turkey Creek Canyon. A trumpet interchange with Colorado 8 north lies at the west end of the U.S. 285 freeway leading east from Mount Glennon to southwest Denver, Sheridan and U.S. 85 at Englewood. Hampden Avenue extends U.S. 285 east as a surface boulevard to Cherry Hills Village and the northern terminus of the route at Interstate 25 (Exit 201) in University Hills, Denver. Historically U.S. 285 follows what is now Colorado 8 north through Morrison and east across the Hog Back along Bear Creek. A portion of this alignment was submerged by the creation of Bear Creek Lake. This includes the former split with Colorado 70 (Hampden Avenue) by Mount Carbon. Morrison Road otherwise represents old U.S. 285 east to Wadsworth Boulevard in Lakewood. U.S. 285 took a stair stepped alignment from Morrison Road along Wadsworth Boulevard north, Jewell Avenue east, Pierce Street north and Mississippi Avenue east to Colorado 95 (Sheridan Boulevard). Entering Denver, U.S. 285 joined another section of Morrison Road northeast through Westwood to Alameda Avenue at Barnum. The US highway lined Alameda Avenue (Colorado 26 today) east to its end at U.S. 85 & 87 in Baker. 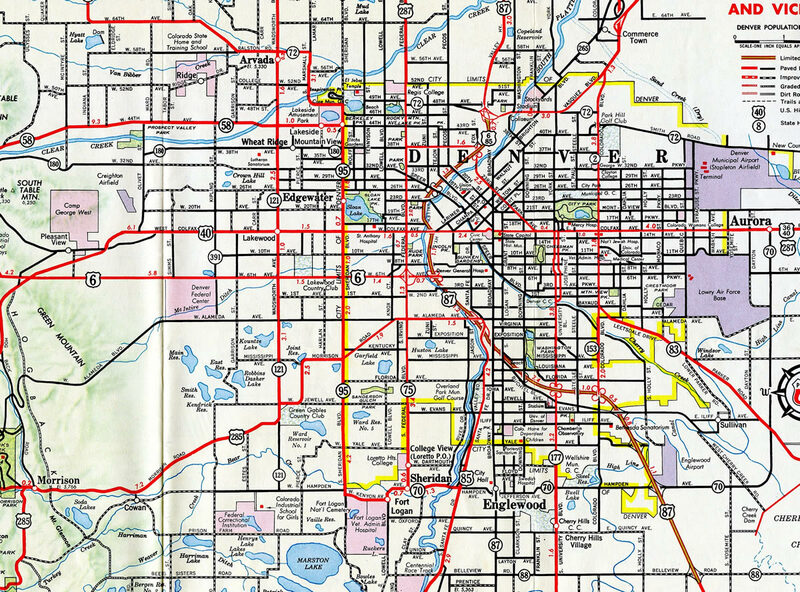 1960 map of U.S. 285 at Denver. 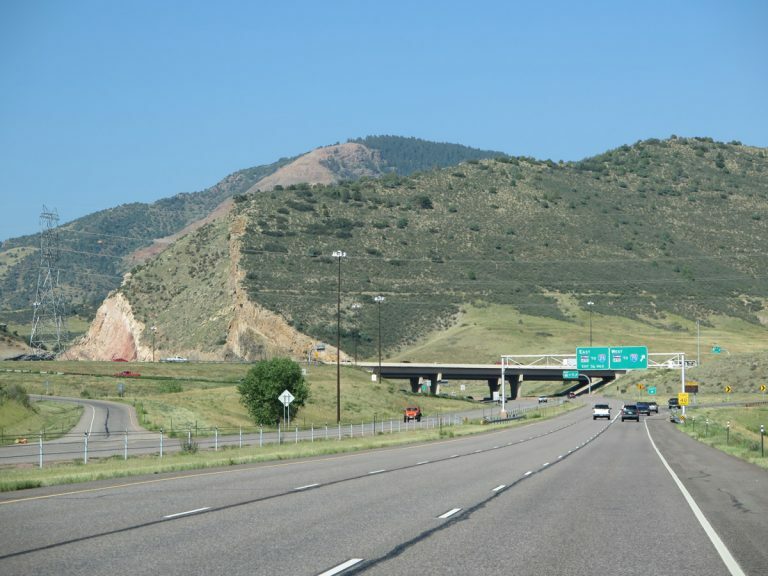 Completion of the Colorado 70 freeway east from U.S. 285 near Turkey Creek Canyon to Lakewood ultimately led to the relocation of U.S. 285 south from Morrison Road. 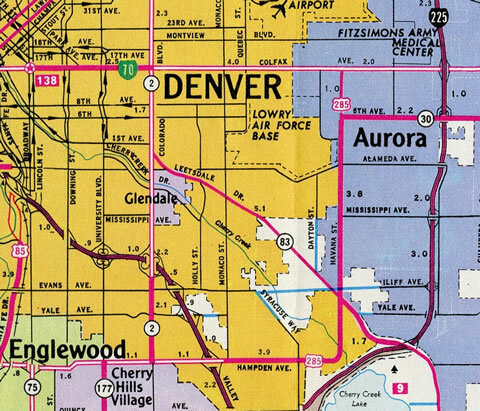 AASHTO approved the relocation and extension of U.S. 285 east over Colorado 70 to I-25 at University Hills, Denver, and Colfax Avenue in Aurora on June 26, 1973. The northeast extension of U.S. 276 in Denver - 1976 Colorado Official Highway Map. Following Hampden Avenue east, U.S. 285 traveled three miles from the current end at Interstate 25 to the Kennedy section of Denver, where it curved north onto Havana Street. Havana Street north took the route another 5.8 miles into the city of Aurora, where it ended at U.S. 40-287 (Colfax Avenue). 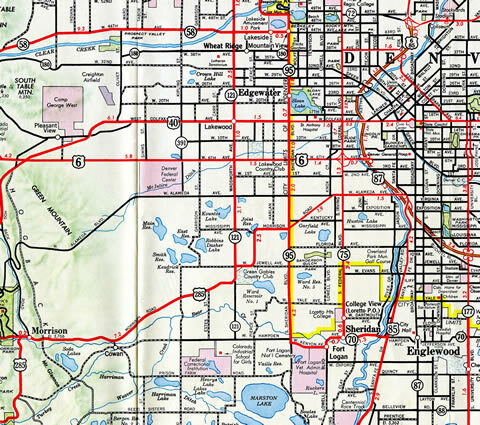 Today all of this route northeast to 6th Avenue is a part of Colorado 30. AASHTO approved the elimination request from Colorado for U.S. 285 on June 28, 1978.